Brooke Maxfield knows what it’s like to be homeless and hungry. The 23-year-old Worcester State senior has a great relationship with her parents now, but three weeks after she turned 18, they kicked her out of the house. “Back then I was a troubled kid, so it was the tough love I needed to make me realize that the path I was on was not sustainable,” she says. At first, Maxfield stayed in hotels and motels, but that quickly depleted the $1,000 that she had saved. “So, I was sleeping in my car and couch surfing,” she says. There were many days when food was scarce, and she didn’t have enough to eat. Then she heard about the Supplemental Nutrition Assistance Program, or SNAP, and went to the local office to apply. “They gave me an emergency SNAP card that day with, like, $200 on it and it quite literally saved my life,” she says. 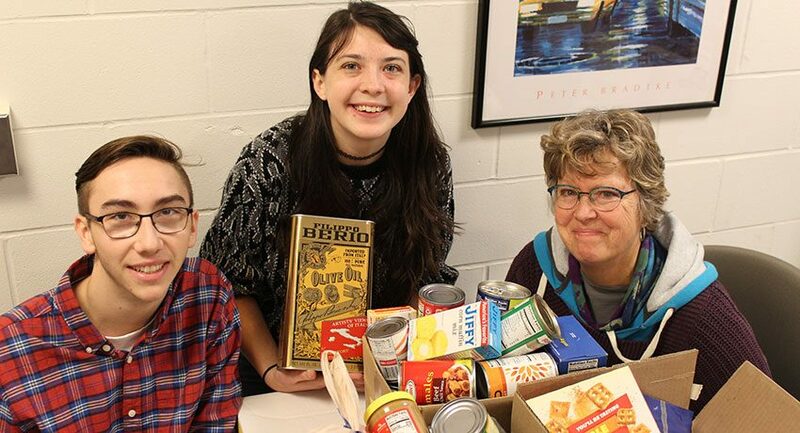 Those challenging experiences are a main reason that Maxfield is among students working to open a food pantry on the Worcester State campus for students in need. The pantry, which is set to open at the start of the spring semester in the Student Center, will provide non-perishable items to students who lack access to affordable and adequate quantities of nutritious food. Recent research conducted by a WSU graduate student found that about one in three students has either low or very low food security, according to Joanne Jaber Gauvin, staff assistant in the Urban Action Institute, who has been helping to guide the student-led food-pantry initiative. Students will be able to go to the pantry, show their One Card and take what they need. “It will be weighed, but just for tracking purposes, so that we can maybe later down the line use that information to get grants or track how much food we need,” she says. When she arrived at WSU and saw the campus SNAP office, where needy students can sign up for assistance, it struck a chord. “It just really hit home,” she says. “I really identify with the people who need these services and I want to help out in any way I can.” She soon became involved with the office and other anti-hunger and community service initiatives at WSU. The food-pantry effort has involved students from the SNAP practicum, which awards course credit for students who help in the campus SNAP office and with other projects; Worcester State Enactus, an entrepreneurial club that’s very involved with community service; and the Urban Studies Club, which works on several anti-hunger and community initiatives. To help stock the pantry, Worcester State employees who attend President Maloney’s Holiday Reception from 4:30 to 7 p.m. Dec. 11, are asked to consider bringing a non-perishable food item. Donors will receive an extra ticket for the evening’s raffle. Plans call for naming the pantry Thea’s Pantry, after Thea Aschkenase, a 2007 alumna of Worcester State University. Aschkenase is a life-long advocate against hunger. As a Holocaust survivor, she experienced extreme deprivation and knows intimately what it is like to be hungry. After resettling to the United States, she devoted her life to the eradication of hunger, including during her time at Worcester State. A drive to raise up to $10,000 to name the pantry for Aschkenase was begun recently. According to pantry organizers, a donation not only honors her commitment to end hunger, but also assists students who experience food insecurity to eat so they can stay focused on their studies and successfully complete their education. To give securely online, visit alumni.worcester.edu/TheasPantry. 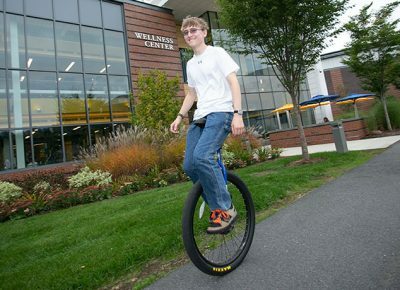 Daniel Keller ’21 recently completed the Mount Washington Auto Road Bicycle Hillclimb, a 7.6 mile trek up the highest mountain in the Northeastern United States, on his unicycle. What appeals to you about the unicycle? Riding a unicycle is a unique experience. It kind of makes you feel like you’re floating, while still having a direct connection to the ground. It’s a good conversation . . .
Caleigh – that’s a thoughtful idea. 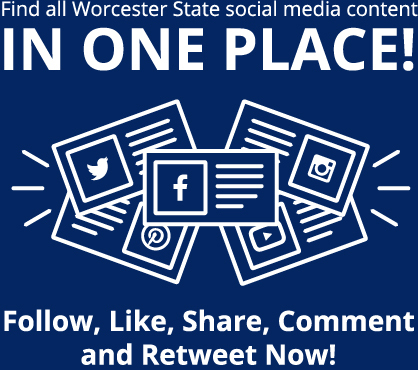 If you haven’t done so already you could perhaps reach out to Student Involvement (studentinvolvement@worcester.edu) or ResLife (reslife@worcester.edu). We’d love to hear what you are able to do! Hello, my name is Caleigh Davis & I’m a senior at Worcester State. Myself & a group from the OT department were assigned a community service project for class and are very interested in keeping our project school based at our home of WSU. We were wondering if we would be able to conduct a food drive in order to donate non-perishables to the food pantry at WSU. I’m unsure of the logistics necessary to make this happen, but we were hoping to place flyers & boxes in residential halls in order to obtain donations for the new food pantry. I hope to hear back soon with more information on this potential opportunity! thank you!